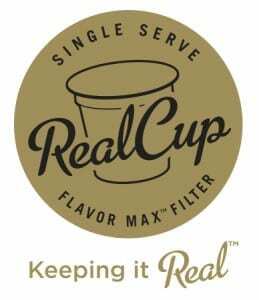 Wolfgang Puck Coffee is partnering with Mother Parkers™ Tea & Coffee to produce a new EcoCup™ single serve Keurig™ K-cup® for a variety of it’s single serve coffee flavors. Roasts included in the initial launch are: Rodeo Drive, Breakfast in Bed, Hawaiian Hazelnut and Jamaican Me Crazy. It is expected that the varieties and flavors will continue to expand as they continue to grow the new model into retail, food service and office coffee markets. The designers of the EcoCup™ have created innovative ways to package and design the single serve K-cup® in so that it is easy to dissemble and recycle. Instead of discarding the entire capsule, both the at-home consumer or the OCS (Office Coffee Service) customer can easily pull off the top via a pull-tab, add the K-cup® to the recycle bin, add the contents (coffee grounds) to a composting bin if available, and discard the lid and filter. Without question, this is a step in the right direction. The EcoCup™, which will be included in RealCup™ brand portfolio, won “Most Innovative Product” first place award at a recent Packaging Innovators Competition. Mr. Paul Yang, the Manager of Packaging Development and Sustainability at Mother Parkers’ made the successful pitch for the new product. There were nearly 200 coffee service industry professionals who voted the EcoCup™ the number one single serve coffee capsule when narrowed down to seven of the competing products. The EcoCup™ coffee capsules are already being used by Higgins & Burke™ loose leaf teas, and China Mist® has joined the lineup as well. With the Wolfgang Puck announcement, we’re sure this isn’t the last we’ll see of big names stepping up and doing the right thing where recyclability and the environment is concerned.